LONDON, Sept. 25, 2018 /PRNewswire/ -- Concierge Auctions is to sell Villa Passalacqua, a 17th century villa situated in the village of Moltrasio on the shore of Lake Como, Italy. 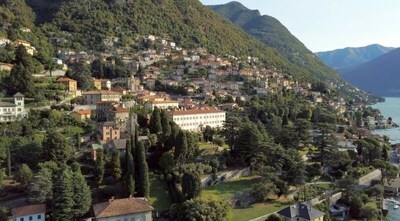 The historic property — one of the most expensive real estate listings in Europe and a rare offering for an Italian National Trust property to be in move-in condition with all necessary approvals and authorizations in order — is recognised as a national monument of Italy, having played host through the centuries to a number of significant figures in politics, art and music, including former British Prime Minister Winston Churchill, and incorporating frescos painted by renowned neoclassical artist Andrea Appiani, chief artist of Napoleon Bonaparte. Previously quietly listed at €100million, the villa will sell at auction on 30 October, with a reserve price of €20million. Set in grounds of 4.6 acres, the villa was originally constructed as the vision of Count Andrea Luccini-Passalaqua, who hired the best architects and designers of the late 17th century to build him a landmark property. Designed for entertaining, the main house offers a total of 26,501 square feet (2,462 square meters) of living space including frescoed reception rooms and nine bedroom suites. A secondary villa within the grounds offers a further six bedrooms across 4,000 square feet (372 square meters). Internally, the property is filled with antique furniture, Venetian chandeliers and exquisite carved ceilings, whilst kitchens and bathrooms include contemporary finishes. Beneath the gardens are some 11,087 square feet (1,028 square meters) of breath-taking catacombs, cellars, and underground rooms and walkways linking the main villa to the lake front. These spectacular underground stone tunnels allow guests to enjoy the private marina and the lake without ever having to leave the property. Externally, there is a swimming terrace surrounded by lemon and olive trees, a 200-year-old greenhouse, 11 working fountains, immaculate landscaped Italian gardens and a private dock. Composer Vincenzo Bellini lived in the villa from 1829-1833, composing operas Norma and Sonnambula during his time there. In the preceding years, the villa hosted some of Europe's most glamourous soirees, with Winston Churchill amongst the notable guests. Charlie Smith, European advisor for Concierge Auctions, comments: "This auction is truly a once in a lifetime opportunity to purchase a piece of history. Since the introduction of an appealing new personal tax regime at the beginning of last year, Italy is proving an increasingly popular option for property buyers from Europe and the Middle and Far East. The villa is one of the most significant private houses in the most sought-after part of Lake Como, but has considerable commercial potential, as a hotel, private members club, or wedding and events venue." The property is open for preview daily between 13:00 — 16:00, by appointment. To book or register to participate in the sale, visit www.conciergeauctions.com.